If it is not the snow its the wind! Well winter has certainly hit us with a vengeance this last week with a blizzard and deepening snow. 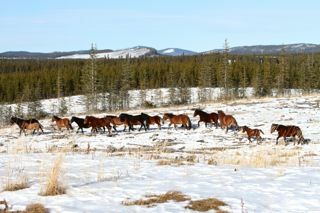 The drifts along with the bone chilling cold is very hard on all the wildlife including the wild horses. The combination of these weather factors can take its toll on the wild horse herds, especially the young and older horses. It is important to note this as these are some of the natural events that help control the wild horses populations. Not only does finding forage become challenging, so does the availability of the natural minerals that the horses and other wildlife need in their diets to keep them healthy. 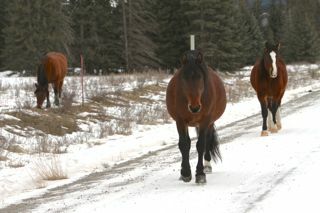 We were delighted when we came across these three young horses who showed no fear of us and our vehicle. We would soon discover why. As with some bighorn sheep we have come across in our travels, they knew that our vehicle carried a delicious treat. Road salt!! They seemed completely unconcerned about us as they painted a new design on all sides of our vehicle with their tongues. 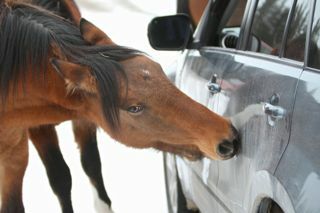 The young mare even stuck her head inside the window to have a look at our two Akitas. Once they had their fill off they went. How can the government condone their wholesale capture of herds of these beautiful horses where most end up going for slaughter? How can the timber companies say these horses are vicious and attack their workers? All they are really trying to do is survive all the hardships that they must endure, especially in these harsh winter months they are facing this year. That leads us into our next point of the ongoing campaign to have you, the wild horse supporters, help convince the ESRD not to have a capture season this winter. Postcards are still available (see our previous post to obtain the postage-paid cards) and also letter writing is very much encouraged. As of December 6th, we now have a new minister in charge of the ESRD. We can only hope that he will listen to us Albertans about the plight of these horses and not just the money interest and the horse trappers who want to see them gone.